Ho, Nov. 21, GNA - Mr Kwasi Owusu Yeboa, Volta Regional Minister on Friday said recent allegations of lack of cooperation between the Volta Regional Coordinating Council (VRCC) and the Asogli State might be due to misconceptions about the functioning of government machinery. He was reacting to protestations by Togbe Afede XIV, Agbogbomefia of the Asogli Traditional Area during a meeting with representatives of political parties in Ho on Sunday over the regional administration's relations with his chiefdom. The Agbogbomefia's widely publicised charges include the alleged sloppy handling by the Regional Coordinating Council of a request by the Chiefs of Asogli to have audience with President John Agyekum Kufuor. Others were a "plot" that prevented the US Ambassador Mary Yates from paying a courtesy call on the Agbogbomefia when she visited the Region in May this year and the refusal of the VRCC to facilitate a meeting of the Agbogbomefia with Heads of Departments in the Region, among other things. Mr Owusu-Yeboa said he and the Regional Administration remained committed to working with all Chiefs in the course of the development of the Region but would not like to create the impression that he was putting any one of them above his peers. He said there were time-honoured norms, practices and procedures governing the institution of chieftaincy in its dealings with political authority that the VRCC must comply with. The Regional Minster said acceding to the Agbogbomefia's request on the VRCC to arrange a formal meeting between him and Heads of Departments would be a bad precedent. "We won't do anything that would construe us to be selective," he stated. Mr Owusu-Yeboa said the VRCC had no input in the programming of the US Ambassador Yates visit to the Region, adding that the notion that the VRCC had plotted to expunge the Agbogbomefia from the Ambassador's schedule was in bad taste. He said the President's inability to address the recent Volta Congress, meant to showcase economic potentials of the Region, was because the Congress clashed with other engagements of the President while he was on tour of the Region. 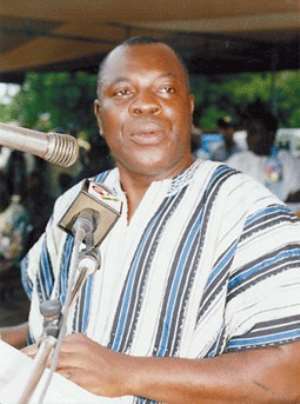 The Minister said the Agbogbomefia's complaint that he was not informed early enough of the President's intention to pay a courtesy call on him so that he could plan a more befitting reception and perhaps a durbar as happened in the Northern part of the Volta Region, had a tinge of some tribal or sectional connotations. Mr Owusu-Yeboa expressed strong reservations about the forum used by the Agbogbomefia to launch an attack on him and the political authority in the Region. The Regional Minister said rather than making frequent references to bad roads and lack of development of the Region, the Agbogbomefia should have acknowledged that some progress had been made in the infrastructure development of the Region. He said within the last three years the dusty "lane" from the traffic lights in Ho to the Residency had been widened and tarred, other roads within the Ho Township had their street lights fixed and the Central Market rehabilitated. Mr Owusu-Yeboa said if the Agbogbomefia had been in the country consistently for the past 10 years, he would have attested to the run-down nature of roads in the Ho area and other parts of the Region, and the NPP administration's efforts to improve the situation. The Minister said he was, therefore, confounded by the persistent complaints by the Agbogbomefia regarding the lack of improvement in the infrastructure situation in the Region in the last three years.